Putting together a budget is one of the best things you can do to take control of your money, and while I love online budgeting apps, there are a lot of people who like writing things down. To help those of you out, I’ve got a huge list of free budget templates for you to look through. I literally scoured the internet for you (with the help of Pinterest) to find these free budget templates. Let me say something about Pinterest and budget templates… there are a lot of them that are very… ehhh… feminine. Think flowers and scrolly fonts. That’s awesome, but I tried really hard to find a clean, straight forward budget printables that work for every kind of M$M reader. Some of these free budget templates will require an email address to access, but I went through them all to make sure they were worth it. There are ones that are great for side hustlers, zero-based budgeters, envelope system budgeters, those who prioritize tithing, and more. It’s also made me think a lot about creating my own M$M budget template that would take into consideration what both my readers and I would want out of a printable budget template. Stay tuned, and you can give me some suggestions in the comments! Wait, what are budget templates? 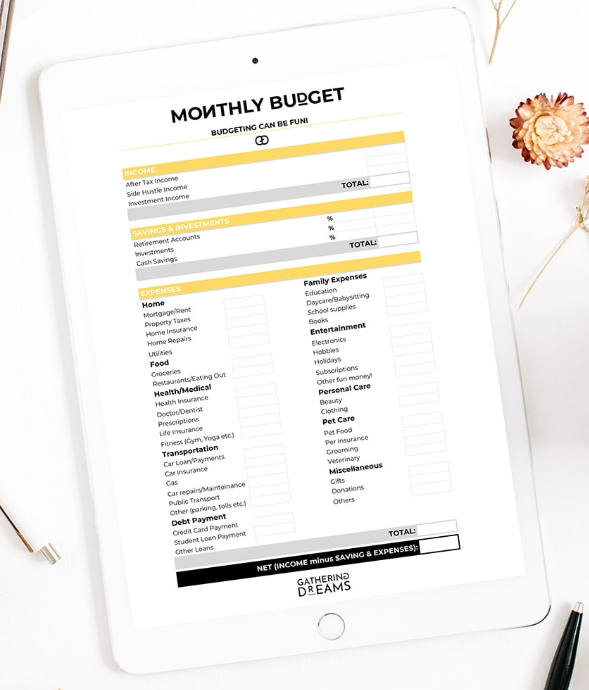 The point of a budget template is to give you a place to write down your income and expenses (including debt and savings) so that you have a physical reminder of what’s coming in and going out each month. Again, I love online budgeting software (Personal Capital is the free tool that my wife use to keep track of our spending and our investments), but there is something about taking pen to paper and writing things out. There is actually scientific evidence that says that writing things down is like magic for your brain. You know I’m not a scientist, but I’m still going to hypothesize that it’s good for budgets too. 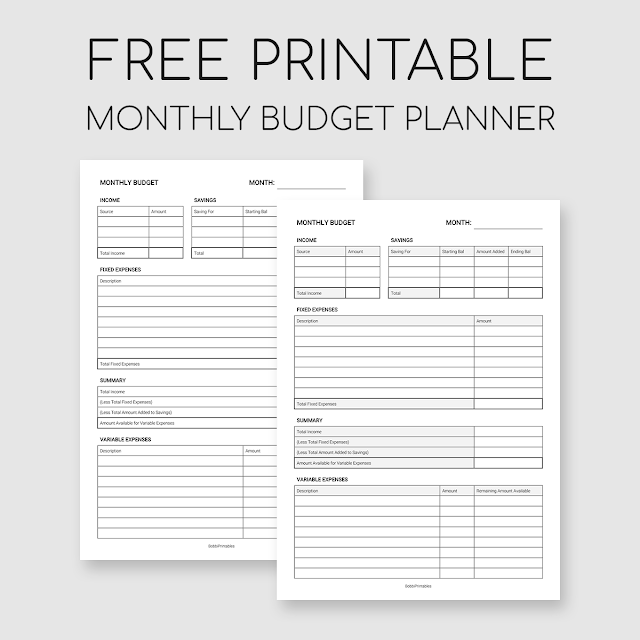 On this list of free budget templates, you’re going to find printable budget worksheets. Basically, you print these up, put them somewhere you’ll see, and use them on a regular basis. You can put your budget on your fridge, in your day planner, wherever! This is actually three different worksheets, including a debt tracker, to help you become a better money manager. Besides the debt tracker, what I like about this one is that it gives you plenty of room to include different income sources, which is good if you are earning money from different side hustles. From this site, you are getting six different free budgeting pages, including a monthly budget planner, weekly meal planner, Christmas savings, etc. In the monthly budget planner, shown below, you can plan for over payments on your mortgage and your expenses are broken down into different categories for accommodations, transportation, household, medical, general items, and debt. This printable is really more of a list of your bills rather than a comprehensive budget breakdown. You list your bills, what you paid, when you paid, etc. Something like this would be a nice way to remind yourself of what’s due and when. 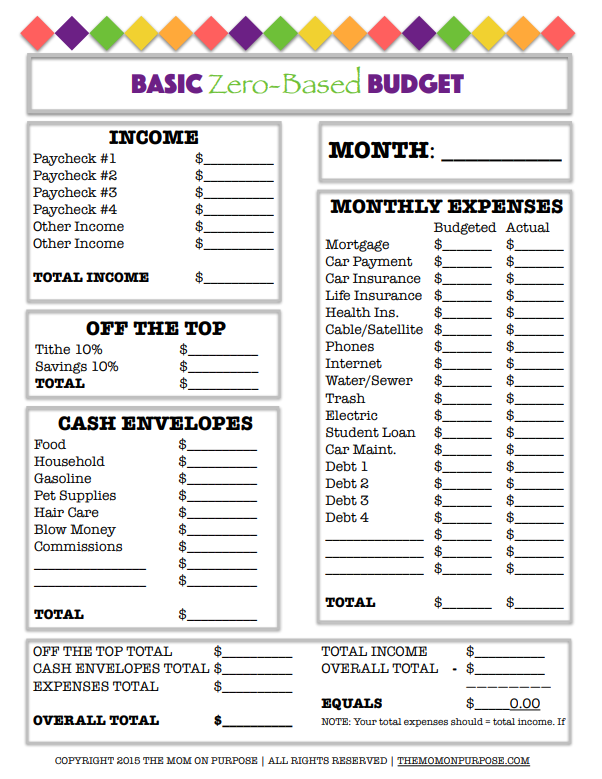 My favorite thing about this printable is that it literally puts savings as your top priority. There aren’t budgeting categories, instead, it breaks your budgeting down into fixed and variable expenses, so it’s really flexible depending on your situation. This site actually has a bunch of free printables, from a sleep tracker to weekly and monthly calendars. 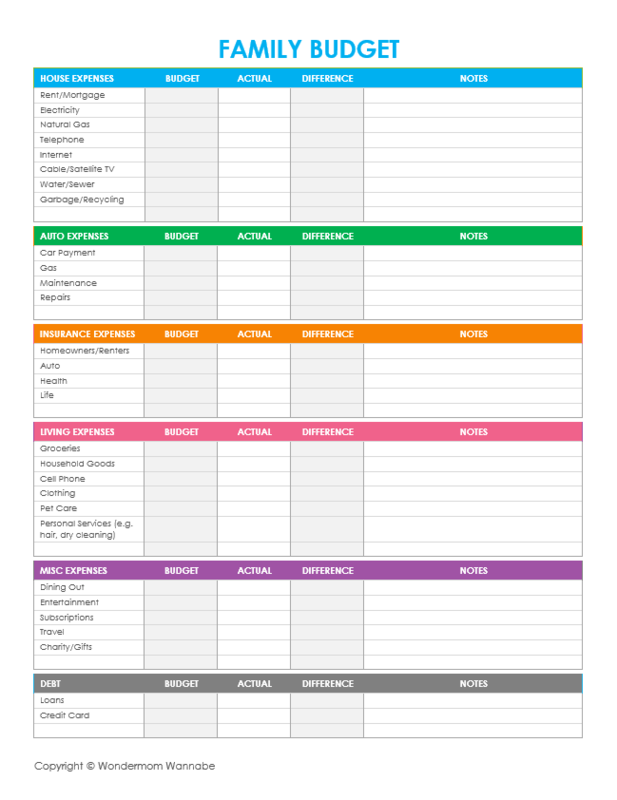 This is a fun, color-coded budget template that gives you a place to write down your starting balance each month, your debt, and your income. You have the choice of a few budgeting categories, but I really like that it gives you a place at the bottom to write out your savings plan. Cash envelope budgeting is when you allocate money for different budget categories and literally put cash in an envelope so you can see how much you have to spend and what’s left over. This site gives you several different printables that you print out and fold into an envelope for your cash. Each envelope gives you a place to track your expenses, and the site tells you how to use the envelope system if you aren’t familiar with it. Along with how to create and implement a zero-based budget, this site gives you a free template that works with zero-based budgeting. There is a place for listing up to six different income sources (another one great for side hustlers), but there is also a place to budget your tithes and space for cash envelope amounts for things like gas, pet supplies, and fun money. You’re not going to get a place to note your income because this template focuses only on budget categories, like a house, auto, insurance, living, debt, and misc. For each bill, you can list your budgeted amount, your actual payment, and the difference. Even though it leaves out savings, you could easily write that into one of the blank lines. It’s explained in detail on their blog, but the 50/30/20 rule means that you are putting 50% of your income towards your needs, 30% towards your wants, and 20% towards your goals. The focus is on using the money you have instead of adding any debt – I like it. 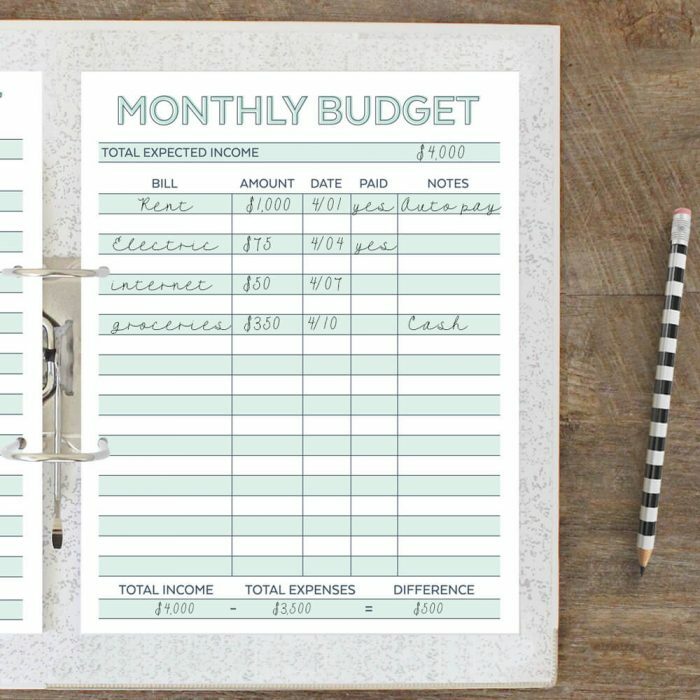 This budget template puts savings at the top, you can mark off when bills are paid, and there is even an additional printable calendar that will help you keep track of when your bills are due. This one is pretty cool because you can either print it up or use it in Google Sheets. There’s a place to include after-tax, side hustle, and investment income. There are also clear budgeting categories for home, transportation, debt, family expenses, personal care, etc. The thing I like best about this one, besides the super clean look, is that you can list what you’re putting towards investments, retirement accounts, and cash savings. 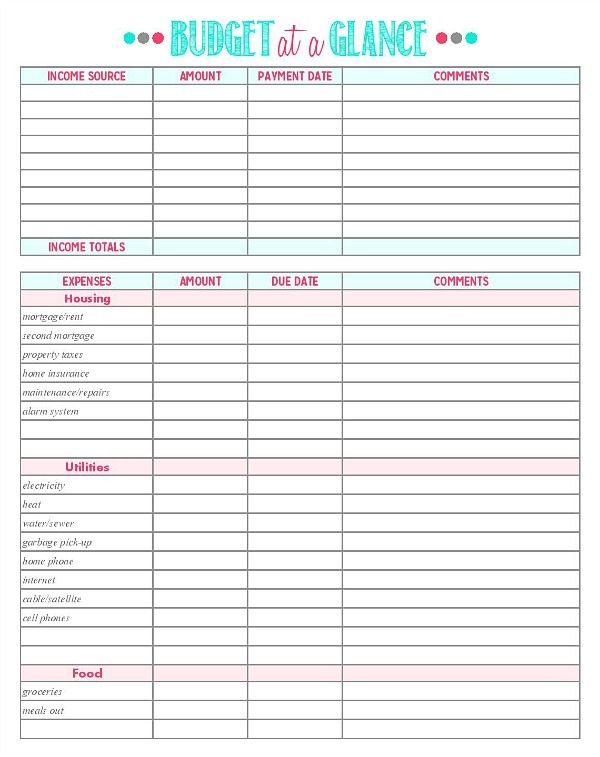 This template is a really nice comprehensive budget that gives you five different lines for income. The budgeting categories are broken down into variable vs. fixed expenses. There are lots of lines for debt payments, which I know you won’t be using forever, and it also works well for cash envelope budgeters. Not a printable budget person? I do think that there probably is something to literally writing out a budget, but I totally get that there are a lot of you (myself included) who would rather use technology to aid with budgeting. The point is to try some things out, find a budgeting system that works for you, and use it. 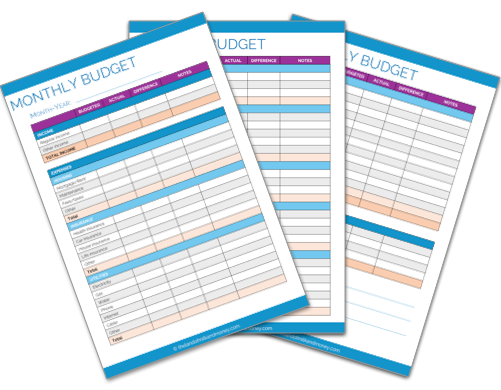 Have you ever used a printable budget worksheet?